Could you have lived in the Sawtooth Valley 10,000 years ago with only a rock for shelter and stone tools for hunting and gathering? Prehistoric people did live in the Sawtooth Valley, if only temporarily. Imagine surviving in this harsh climate wearing animal hides for clothes and making tools out of rocks, bones and wood for hunting and gathering. Courageous or crazy? The Redfish Rockshelter holds ancient secrets of Stanley’s history. Evidence found at this archeological site near Redfish Lake dates back 10,000 years ago. When the site was excavated in 1972 and 1973, the discoveries were astounding. Hastkett points found at the Redfish Rockshelter date back to 9860 BP (Before Present time of 1950). These artifacts can be described as a stone tool that has a projectile-point created by flaking with a rounded base. They were believed to be used by hunters to thrust or throw the tool at large game. However, the discovery of these artifacts at the Redfish Rockshelter suggests it was also used to gather plants and for salmon fishing. Also found during excavation were small flaked lithic tools, Intermountain Ware ceramics and some ground stone. These findings date back to the Late Archaic period (5000 to 3000 years ago). What is so extraordinary about this discovery? It places mid-Plano period culture in a mountain environment where it was originally recognized as hunter-gatherer communities living on the Great Plains. Fast forward to the Sheepeater Tribe…..
After 1700 AD, a band of mountain-dwelling Western Shoshone Indians inhabited the Sawtooth Valley. They were called the Sheepeater Tribe. Can you guess why? Most tribes were named based on what they ate and their diet consisted mainly of mountain sheep. While in the Redfish Lake area, the Sheepeaters used the Redfish Rockshelter. Being a nomadic tribe, they most likely only stayed for a short period of time. They lived off the land by eating plants, game and fish while using timber and rocks for tools. They lived peacefully as they migrated throughout the central wilderness area sharing their culture and social traditions with other Idaho Shoshoni tribes. And then the white men came along. During the 1860’s, the mining boom brought white men to the area. As the story goes, the Sheepeaters and white men had their differences. The Sheepeaters were being blamed for stealing horses, robberies and for murdering two prospectors, two ranchers and five Chinese miners. These accusations began the Sheepeater Indian War of 1879. Colonel Bernard led his troops into the rugged, unexplored and unmapped territory of central Idaho in search of the tribe. The pursuit lasted about four months until 51 Sheepeaters surrendered. They admitted to killing the ranchers, but denied killing the prospectors and Chinese miners. After being questioned, they were relocated to the Fort Hall Reservation in southeastern Idaho. Later, the rumor mill circled with tales of white men disguising themselves as the Sheepeaters and killing the Chinese miners then living off their gold. They laughed when the Indians were blamed for the crime. 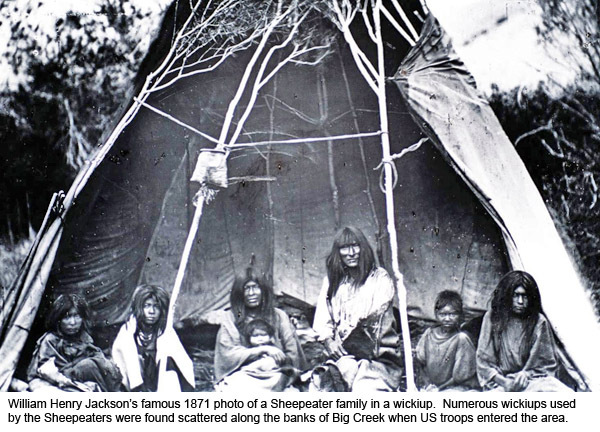 The Sheepeater Indian War was the last Indian war fought in the Pacific Northwest. The Redfish Rockshelter is still standing, however, the site is currently closed.